American Aldes patented* Zone Register Terminals (ZRT®) are designed to introduce flexibility and dynamic control to central ventilation systems. Used in both large and small systems, the ZRT regulates ventilation without the need for individual fans. Each ZRT is a combination grille, register box, control damper, and optional flow regulator(s). This unique combination provides up to four different control schemes without the need for expensive pneumatic, electronic, or DDC control systems. By replacing static grilles in large central exhaust systems, the ZRT-1 model provides on-off control for on-demand ventilation. The optional model CAR-II Constant Airflow Regulator can be installed in the ZRT-1’s extended duct collar to place a maximum flow limit on each terminal. 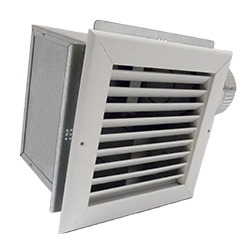 The ZRT-2 model can be used for combination low-flow indoor air quality ventilation and on-demand high-flow spot ventilation, such as a bathroom exhaust fan, using the same central system. This is achieved by integrating a CAR-II minimum airflow controller directly into the damper sub-assembly. With the damper completely closed, the factory calibrated CAR-II will still allow steady, low-continuous ventilation during fan operation. When other ZRT terminals are opened for on-demand control of spot ventilation, the closed ZRT-2s will maintain the specified low continuous rate through the CAR-II minimum flow control. By opening the ZRT-2’s control damper, the low-flow regulator is removed from the air stream, allowing either controlled (optional using a second CAR-II) or full maximum-boost ventilation.